An executive terrace suite. All photos courtesy of Sentinel. 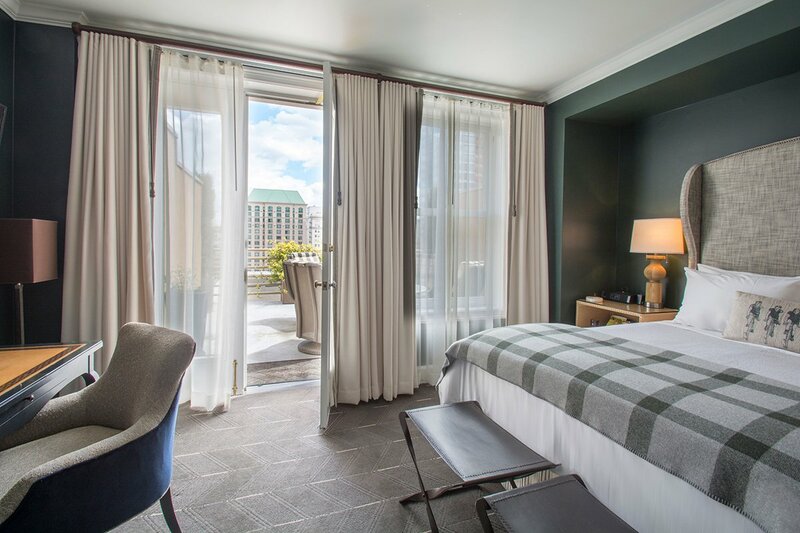 Writer and historic preservation consultant Jessica Ritz checks into a luxury Portland hotel for a wonderfully curated taste of the city. Think repurposed buildings, locally sourced products, and a rooftop beehive. PORTLAND, Oregon – Walking around Portland's West End and Pearl District downtown, it boggles the mind to think back to the films of the city's best-known director, Gus Van Sant. The world of street hustlers, addicts, and underdogs as depicted in Drugstore Cowboy and My Own Private Idaho hasn't vanished. PDX maintains its share of scruffiness, but the era of flophouses and zero-frills diners has largely given way to the design and food-obsessed cultural tide for which Portland is widely lauded and parodied. 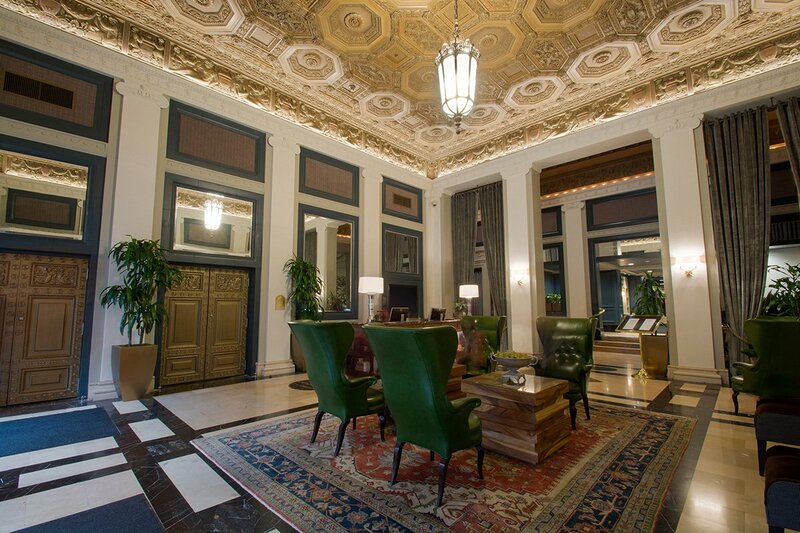 In a city where the quest for curated authenticity means repurposed and reclaimed vintage everything, the historic Sentinel, part of the regional Provenance Hotel chain, brings a particular twist to the post-Ace Hotel generation. One of the city's high-end options, the Sentinel occupies two buildings listed on the National Register of Historic Places, the elder of which starred in My Own Private Idaho as the lead characters' illegal residence. 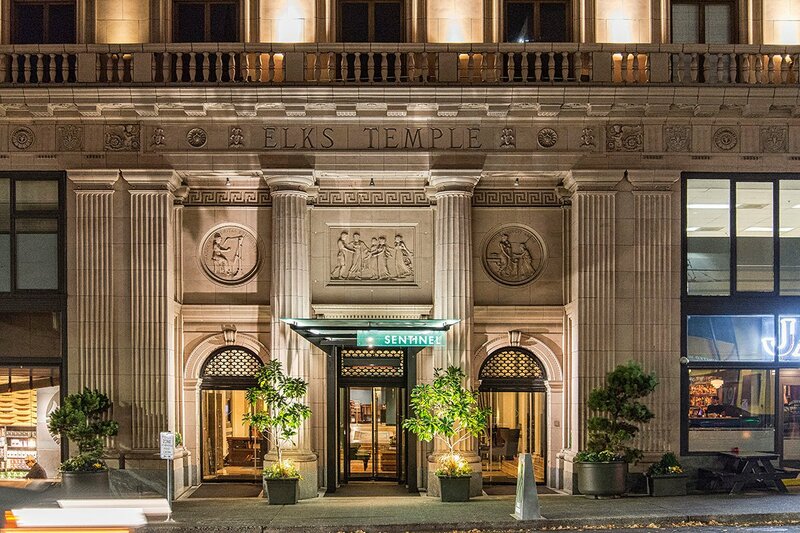 The hotel lobby on the west side of the property occupies a jaw-dropping, ornate Renaissance Revival-style Portland Elks Lodge (#142 from 1923). The former Governor Hotel, which operated as the Seward Hotel from 1909 to 1932, is now Sentinel's second building. 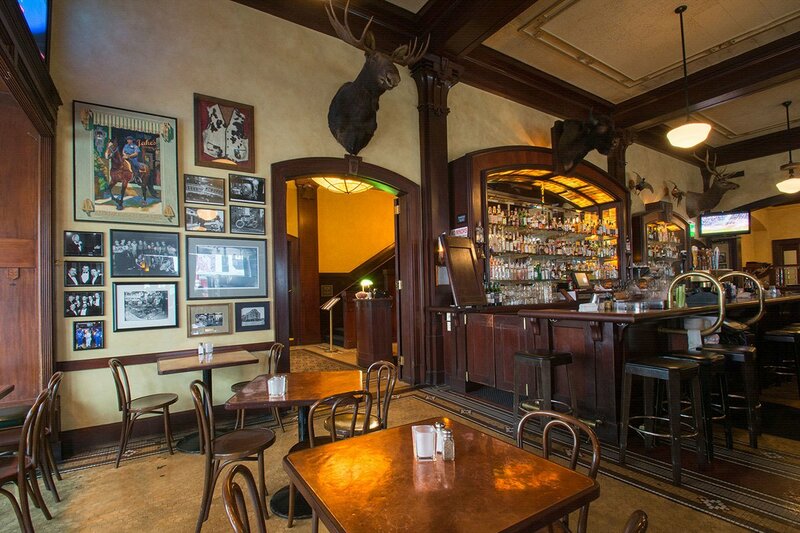 It was modified in the early 1990s to add Jake's Grill, a pseudo old-school restaurant that retains enough charming vintage tiles and dark woodwork to make the sight of dudes drinking martinis at 10 a.m. seem about right. The Starbucks that's accessible via the lobby might be a turnoff to travelers who have zero interest in consuming anything chain store-oriented, and the hotel's Jackknife Lounge comes across as a corporate (and on weekend nights, nightclubby) interpretation of the city's famous craft cocktail culture. 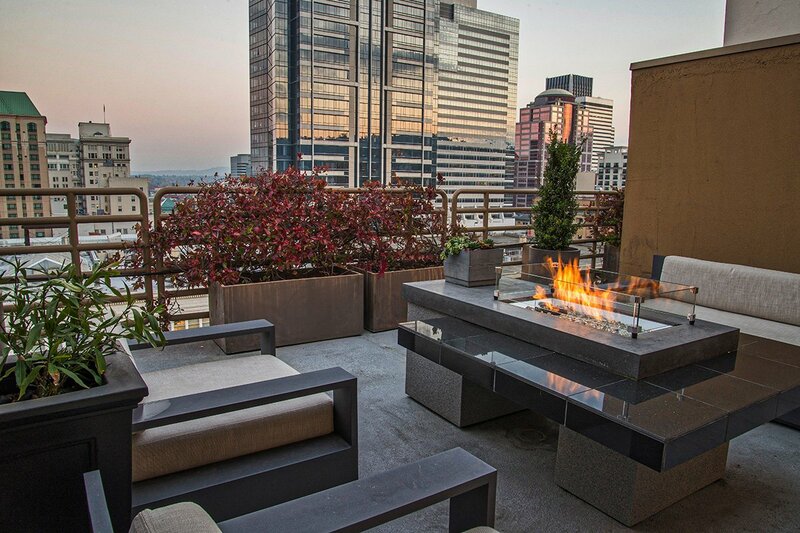 But no matter, because for those who want to soak in the Portland vibe while sleeping on plush mattresses surrounded by cushy, stylish décor in a central location, the Sentinel strikes a happy medium. Rooms are decorated in a highly staged antique-y Soho House-inspired vein (has anyone actually read the books on the shelves? ), with deep hunter green walls and a trim, tailored British feel, albeit with classically Pacific Northwest Pendelton wool blankets and hometown fave Schoolhouse Electric wall sconces in the mix. The Sentinel walks the indie walk by stocking the minibar with PDX-made goods, including Quin lollipops, hand-harvested Oregon salt tins from Jacobsen, and Burnside Bourbon from Eastside Distilling. Honey maker Bee Local even has a chunk of rooftop real estate dedicated to cultivating hives. Want a pint of famed, adventurous "farm to cone" Salt & Straw ice cream? They can hook you up with that. It's just another local hustle. Rates change seasonally and typically start at $189. Click here for reservations. Or get in touch with the Fathom Travel Desk and we can plan your trip for you. Ace Hotel, with all its ancillary food businesses and hospitality-industry-paradigm-busting grooviness is a short stroll away, as are other local hotspots like Heart Coffee, Tasty n Alder, Grüner, Multnomah Whiskey Library, Powell's Books, Canoe boutique, and the over the top (in the best possible way) Blue Star Donuts. The cluster of food carts around SW 10th and Alder, including the dynamite Nong's Khao Man Gai chicken and rice outpost, is directly across the street. Need to get out of the nabe? This being public transit-loving Portland, the street car runs on either side of the Sentinel property, and the city's manageable size makes just about everything easily accessible. Jessica is a freelance writer and historic preservation consultant living in Los Angeles. She is also the founder of Taster Tots L.A., a restaurant and food news blog for young families. You can follow her on Instagram at @jessnritz. She travels for the food, design, and characters.